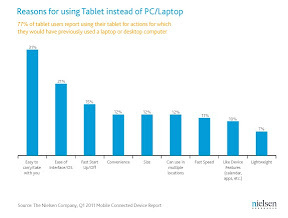 With new entrants like the Samsung Galaxy and the Motorola Xoom, the market for tablet computers is heating up in the United States, even though iPad continues to dominate the conversation – and market. 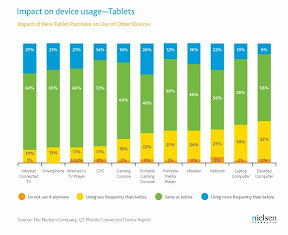 That’s the word from The Nielsen Company’s latest in-depth research on mobile connected devices, which was fielded in Spring 2011. Around half of all tablet owners reported being the only ones in their household using their particular tablet, while 43 percent said they shared the tablet with others. Eight percent said that while they own a tablet used by other household members, they do not use it themselves.